This post does NOT contain affiliate links. I will NOT make a commission if you buy an Instant Pot or any other kitchen tool. I strongly believe that most people have enough and do not actually need more stuff in their lives… and if they do, those items can almost certainly be procured second-hand from a relative, friend, thrift store, or classified ads such as Craigslist.org or Facebook Marketplace. In the case of the Instant Pot, it’s often relatively easy to find a few “brand new in box” ones at a reduced price on the used market. My Instant Pot, most of the time, stays on top of my kitchen counter near the stove. Occasionally, I put it away in a cabinet… but it tends to pop back up within a few days at most. I do not use it as often as my Vitamix (which spins 3 times a day or more), but certainly multiple times a week. Here’s how. I do not typically cook lentils in the pressure cooker simply because I tend to just throw them into whatever dish I am making, for example this bolo sauce. But when occasionally I make a lentil salad, I definitely use the IP to cook the lentils. I used to cook rice in my Instant Pot (usually following the “pot in pot” method), and the results were fabulous. Sadly, I do not do it anymore. We eat rice multiple times per week and I prefer to reduce our arsenic exposure by cooking rice in plenty of boiling water, like pasta. Using a large soup pot, I do a really big batch (4 cups of dry brown rice) every other weekend and freeze in dinner-sized portions. I occasionally cook other grains such as quinoa or farro in the Instant Pot. 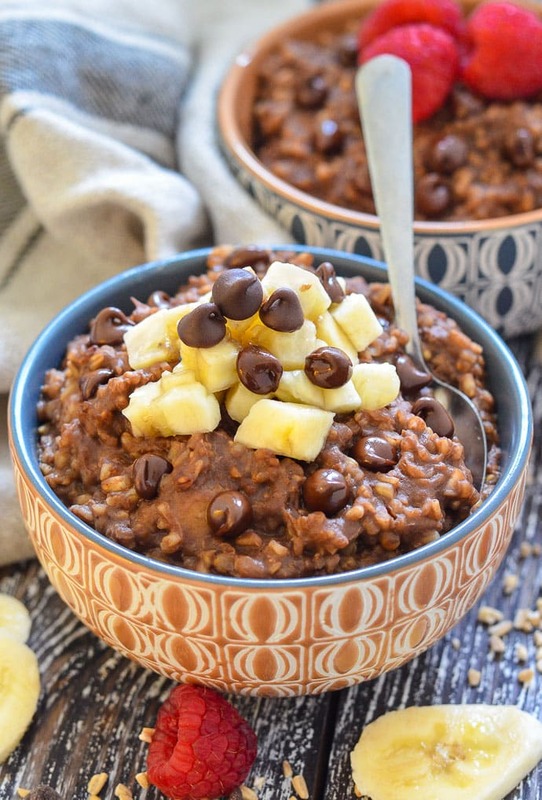 It’s also my favorite way to prepare steel-cut oats (although I personally prefer overnight rolled oats instead). Once or twice a year, I make yogurt in it. I wish I could do it more, since it’s relatively easy, but I haven’t managed to work this step into our lifestyle. Plus, we are very inconsistent at actually eating the yogurt. 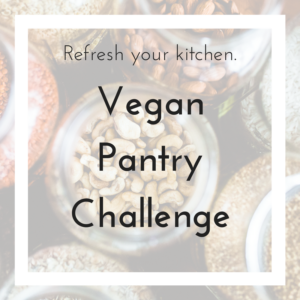 But know that making your own soy yogurt from scratch (using dry beans) is a great way to cut back on plastic pollution, and not that challenging. Keeping the yogurt jars all snuggled up in the pot reduces the chances of spilling your precious concoction, or spoiling it by mistakenly starting the oven while your culturing yogurt is in it. I used to think that using the IP to steam veggies seemed like a cumbersome idea, but now I get it. I just plop broccoli or cauliflower florets, gai lan (Chinese broccoli) or (sweet) potato pieces into a steaming basket. Add 1 cup water to the bottom of the IP and cook on high pressure before doing a quick release. High pressure cooking times range from 1 minutes for broccoli to 10 minutes for whole potatoes.The benefit of steaming vegetables this way, as opposed to using the stovetop, is that I can set it and forget it until I hear the 10 beeps telling me cooking is done. And if I get distracted by my kids – not that this happens very often, mind you….! – I won’t ruin another pot because it ran out of steaming water and the stainless steel bottom separated. The worst that can happen is overcooked broccoli if I don’t release the pressure right away. One less thing to be thinking about when I’m supervising multiple pots… or people. 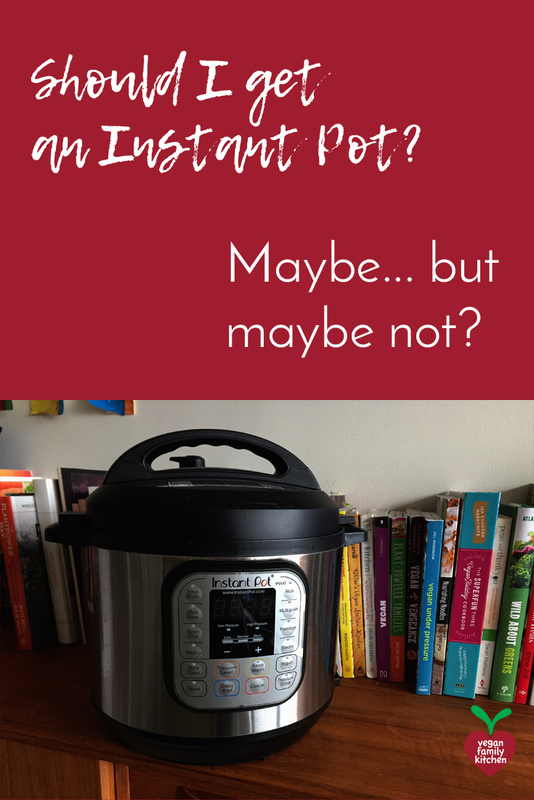 Do you know what is my now-favorite way to use the Instant Pot? Steaming corn on the cob! I shuck a dozen ears of corn, snap them in two (using your hands should do the trick), pile them on the IP rack with 1 cup water at the bottom, and cook 1 minute on high pressure. Carefully quick release the pressure and voilà! Delicious corn on the cob without having to closely monitor a huge pot of boiling water. My corn-growing family was very impressed. I bring our Instant Pot to the cottage every year, and using it to cook corn means that I can step outside to play with the kids and not come home to a burning log cabin. My kids also love roasted potato wedges. I pre-steam the whole potatoes for about 5 minutes on high pressure, carefully release the steam, cut into wedges, toss with a little bit of oil, salt and pepper, and then roast for about 30 minutes. Making seitan on the stovetop requires constant attention to make sure the broth doesn’t boil. If it does, you end up with mushy brain-like concoction that will scare your family away from seitan forever. The good news is that you can plop your seitan rolls in broth inside an electric pressure cooker – without wrapping in foil or cheesecloth – and just cook it for the same time as your stovetop-based recipe suggests. Let the pressure release naturally and the temperature come down all the day… and there you have it, perfect seitan! (Always better texture the day after.) I am not totally sure why cooking under pressure doesn’t cause the same problems as boiling, but it works. Do it! As vegan, the key benefit of pressure cooking is the capacity to go from “only got dry beans and some veggies” to “flavorful bean stew for dinner” in under an hour. This is true with all types of pressure cookers, electric or not, but having a programmable electric pressure cooker like the Instant Pot means that I can prepare dinner at 2 pm before picking the kids up at school. How do I make a quick bean stew from dry beans? On “sauté” mode, I quickly cook an onion with garlic, ginger, and vegetables, then add the spices of my liking (usually a mix of cumin, turmeric and coriander). I drop in some rinsed dry beans (not even soaked) and broth, then close the lid. I set the IP to cook on high pressure for the appropriate time (say, 7 minutes for black-eyed peas) and to “delay start” for 2 hours. Dinner will be ready at 5:30 pm. Just add rice (from the freezer)! Quick-cooking beans like black-eyed peas, mung beans, and split peas are better suited for these dishes, and I keep them in the pantry just for this purpose. If using something like unsoaked black beans, cooking time will be closer to 22 minutes. That means that the veggies really, really soft, and the flavors less delightful. It reduces nutrients to some extent, too. But it beats ordering curry from the Indian restaurant across the street. And you can just blend everything into black bean soup! I am known for my stash of frozen meals. When we come home after my kids’ gymnastics lessons at 6:30 pm, cooking dinner from scratch is not in the cards. But even simple reheating dinner entails painful delays at that wicked time! Solution? Reheat the dish using the pot-in-pot method and the “delay start” feature of my Instant Pot. For this to work well, it’s important that the dish I want to serve for dinner (often a curry or chili) be already mostly thawed. I usually pull it out of the freezer the night before, and defrost for a few extra minutes on low power in the microwave if needed. When liquid enough to transfer, I scoop the food to be reheated in a pot that fits inside my Instant Pot. I place the metal rack inside the IP, add 1 cup of water at the bottom, stack the food receptacle on top and lock the lid. I then set it to cook on high pressure for just 1 minute, and add “delay start” with the appropriate number of hours and minutes. When I come home, I just reheat some rice, or cook fresh pasta. Then I release any residual pressure left in the Instant Pot and dinner is ready. Let’s take my corn example above. Does it take only 1 minute to cook 12 ears of corn? Of course not! One has to take into consideration the time it takes for the pot to come to pressure, and also the time for the pressure to release, naturally or with human intervention. The fuller the pot, and the colder the content, the longer it will take for the temperature and pressure to rise. In the case of corn, it would probably take about 15 to 20 minutes. At that point, the pin will rise, the pot will lock, and the timer will start counting down. Then, for corn, I would be releasing the pressure manually by carefully flipping the valve to “venting”, and that would take 2 to 3 minutes. 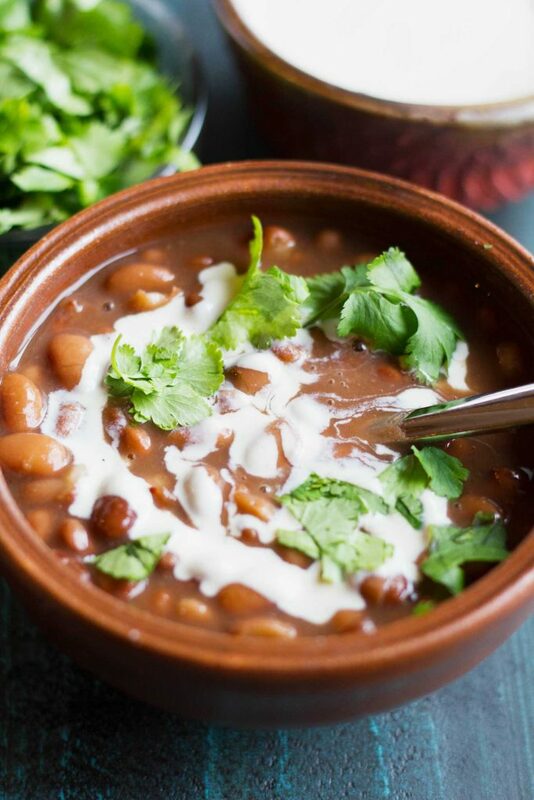 If cooking beans or an actual dish, one would allow the pressure to release naturally for at least 15 minutes before releasing any residual pressure. So, no, nothing really cooks “faster” in the Instant Pot. It just cooks without direct supervision. The fact that I can leave my Instant Pot to work its magic, the same way I would leave a slow cooker, is the number 1 reason why I continue using it on a regular basis. I spend a lot of time in the kitchen already due to recipe testing and making many of our staples from scratch at home. Being able to deal with the beans without actually staying at least within short earshot of the stove enables me to actually do other things like… have a nap. I would never nap with a pot of beans cooking on the stovetop, if only because it would soon leave me with a massive mess of overboiled foam to clean. When I received my brand new Instant Pot, I immediately listed my slow cooker on Craigslist – and it was gone within the day. I didn’t really think the IP would replace the slow cooker, but I thought I would use it much less, and I wanted more white space in my cabinets. About a year later, I hit Craigslist to get a new-to-me slow cooker again – white space be damned. I had read multiple times that the Instant Pot’s “slow cooker” function wasn’t great, and it made sense to me. In normal, “crock pot” style slow cooker, the heat is distributed very evenly: it comes from all around the dish. In an Instant Pot, the heat only comes from the element at the bottom. The stainless steel insert is thick overall, and reinforced at the bottom, but still no match for a ceramic crock. Despite those concerns, I still decided to try the “slow cooker” function last summer when I was at my parents’ home and needed to test a slow cooker curry recipe for my Vegan Family Meal Plans. After reading much advice online, I settled for the “medium” heat level on the IP as an equivalent of the “low” setting on my slow cooker. (Based on temperature charts, the “low” setting on the Instant Pot is more like “keep warm”.) After 7 or 8 hours, the curry was hot enough, but the black-eyed peas were still quite hard, and the veggies level of doneness was not satisfying. It felt like the various ingredients had not cooked together. I ended up transferring everything to the Instant Pot for 4 minutes on high pressure, and at least it was edible. But I am not risking a meal again. Do I need to take safety precautions with the Instant Pot? Register your unit in case there is a recall. As far as I know, at the date of writing this post, there has only been recalls for “slow cooker” type devices manufactured by the Instant Pot company. But it’s good to be aware of recalls, if any. Don’t put the lid on when on “sauté” mode. Your IP will shut down long before it could have exploded, but you’ll still be dealing with a sticky mess. Always carefully lock the lid and make sure the valve is on “sealing” when pressure cooking. Again, nothing will catch fire or explode, but you might burn your food a bit. Always tilt the lid away from you when opening. If you use the IP twice in a row, you’ll find that the seal seems to have puffed up and you may not be able to easily lock the lid back on. Give it a few moments to cool, wiggle the seal a bit to make sure it’s in place correctly, and try again. Do not push down on the lid to lock it. Do not use the IP with an extension to avoid causing a tripping hazard. Is the Instant Pot a good choice for my kitchen… or not? have ample counter space and/or cabinet space to store it (keep in mind it’s better to store the lid upside down and now locked on top, to prevent smells; downside is that it requires more vertical space – 11.5 inches for a 6-qt model). 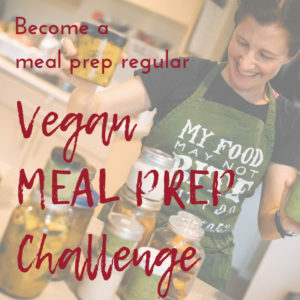 If you don’t struggle with cooking dinner just before meal time, or do not anticipate doing batch cooking any time soon, or aren’t particularly interested in cooking things like beans or seitan from scratch at home, an Instant Pot is not the most pressing item to add to your kitchen. Not that it’s not a nice way to cook… but your stovetop probably does all of the tricks you need. If you have a very small kitchen and will need to put your IP on top of the stove when using it, I do not recommend getting one. I have read countless stories of users who mistakenly put their IP or lid on a hot burner, or turned on a burner by accident while the IP was on top of the stove. In the best cases, they ended up with a toxic mess of melted plastic. On the flip side, if you do not have a stove at all, or a very minimal cooktop (for example, just one induction hot plate), an Instant Pot is probably a great choice for you. It does a lot with a minimal footprint. RV dwellers and camper-van aficionados love their IP! I wish there was an Instant Pot model with just the buttons I actually need: pressure level and cooking time, plus the yogurt function (which keeps the pot at about 110 degrees F for culturing the yogurt). Basically, a simpler, 2-in-1 version of the DUO. All the other “modes” are, to me, not particularly useful. For example, there is a “rice” button but the timing would not work for brown rice. If you know you will never want to make yogurt, than the LUX model will be fine for you. There are new models such as the MAX that are set to take up to 15 psi of pressure (as opposed to max 11 psi for the DUO), and finer-tuned temperature control. This allows for sous-vide cooking and possibly for canning, although you would definitely want to do your research to ensure safe food storage procedures. (Canning low-acid foods – including most vegetables – requires special attention to prevent botulism. Botulism is rare but once you have it it’s really hard to get rid of, and it can be lethal. The risks are not worth taking.) I have not tried it myself, and I do not know how user-friendly it is. I can see how it would make more consistent, nicer vegetables. If that is important to you, I suggest researching that option in depth. I personally stay away from “smart” appliances with fancy LED displays. They are great when they work… until they don’t work anymore. A prime example of this is programmable slow cookers, which often fail due to cheap and short-lived electronic components (and ruin your dinner in the process). Large displays increase the potential for breakage, and then the appliance is useless. Personally, I stay away – you do you! As far as I can tell from their current line up of products, there are no Instant Pot-brand pressure cookers that do not have a stainless steel inner pot. But double check the specifications anyway, just in case. What size Instant Pot should I get? Most often, people wonder whether they should be getting a 6-qt or an 8-qt. I originally bought a 8-qt, because I do a lot of batch cooking, but then regretted it. I bought a 6-qt version and sold the 8-qt to another vegan family. Why? Although the element on the 8-qt is stronger than the one in the 6-qt model, the 8-qt pot took longer to come to pressure, and pressure took longer to come back down naturally. Despite being a big fan of batch cooking, I hardly ever filled the pot even to the halfway point. And the larger surface at the bottom meant more crispy rice. The vast majority of the time, I was using the pot for batches that would have fit a 6-qt fine, yet the pot was taking significantly more space on my countertop. So I switched. Not once, in the six months since my 8-qt was adopted by its new family, have I missed it. For the record, we have 2 adults and 2 young children who still do not eat much, but practically every meal that goes in there yields enough leftovers for at least 2 adult meals. Even with the smaller pot, there is ample room as far as we are concerned. Every Instant Pot comes with a basic rack and with some plastic spatulas. I recommend that you get a steaming basket that fits nicely within your specific pot, whether it’s made of metal or silicone. Metal steaming baskets are often found at thrift stores. Make sure there is no rust! Scour your kitchen for pots that will work well as an inner pot for reheating or other pot-in-pot applications. Glass, ceramic and metal work great. This will enable you to reheat food, make casseroles, cakes and thick dishes like oatmeal without scorching at the bottom. 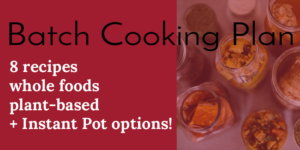 The containers for pot-in-pot cooking do not have to be round! My rectangular food storage containers fit just great in my Instant Pot, and they go straight from fridge to pot. Just do not put frozen glass dishes in the pot – better safe than sorry (and hungry). Nothing at home? Hit the thrift store, you’ll find lots of suitable dishes. An important accessory, especially if you plan on cooking pot-in-pot, is silicone “pinchers” to protect your fingers from the heat when pulling dishes out. Mitts are too bulky for that small space, and anything made out of fabric will get wet from the steam and burn your fingers anyway. You may be able to achieve good results with metal tongs also. The success of the Instant Pot brand should not make us forget that there were makers of electric and programmable pressure cookers before IP came around, and more brands came after. The big selling point of the most popular IP models, in my opinion, is the stainless steel inserts – whereas most brands use either non-stick materials (teflon or similar) or aluminum. Aluminum is not a great choice for tomato-based dishes (or other dishes that are acidic) because the metal can leach into the food. As for non-stick finishes, I generally refuse to use them. They get scratched easily and aren’t very durable. I appreciate that the Instant Pot has a large community of users, which means that questions can be answered not just by customer service but also by thousands of people online (see section on resources below). Their popularity also means that they are closely scrutinized, and information about problems or recalls circulates quickly on social media. Plus, they are a Canadian company (although the appliances are manufactured in China). If you choose another brand, make sure that the insert is made of stainless steel and read reviews carefully and critically before making a purchase. In Europe, there are other, locally-established brands you will probably want to choose from. Where to buy my Instant Pot? If buying a unit that is not completely new, because food actually cooks in there, I would probably prefer buying from a vegan household. If you are considering that idea, why not post a message to your local vegan group on Facebook. For me, for example, those would be the Vancouver Vegans and Plant-Based Vancouver groups. If you live in a mixed vegan-omnivore household and already cook in dishes that are shared with meat, you may not care. If buying a used unit (other than new-in-box), keep in mind that you can buy a replacement seal. They are easy to get from Amazon or from the company itself. 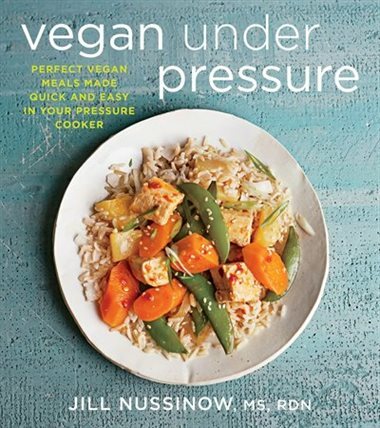 The best vegan Instant Pot cookbook, in my opinion, is Jill Nussinow’s Vegan Under Pressure book. It explains everything about electric pressure cooking in a generous front section (better than the IP manual, really) and provides a wide array of recipes. Not too many pictures, sadly, but still a fantastic resource. Your local library probably has a copy, but if the waitlist is too long you can get a used one at Powell’s Bookstore. On her web site, Jill Nussinow also offers her excellent timing chart for sale. She has put a lot of effort into creating that tool and $5 is a small price to pay for a resource you’ll use multiple times per week. I think it is free for people who buy her book – check your copy. I also like Vegan Pressure Cooking by JL Fields, but I have not used it as frequently as Vegan Under Pressure. Instant Pot Beginners Veg Support: This is Jill Nussinow’s group. There are no silly questions here. 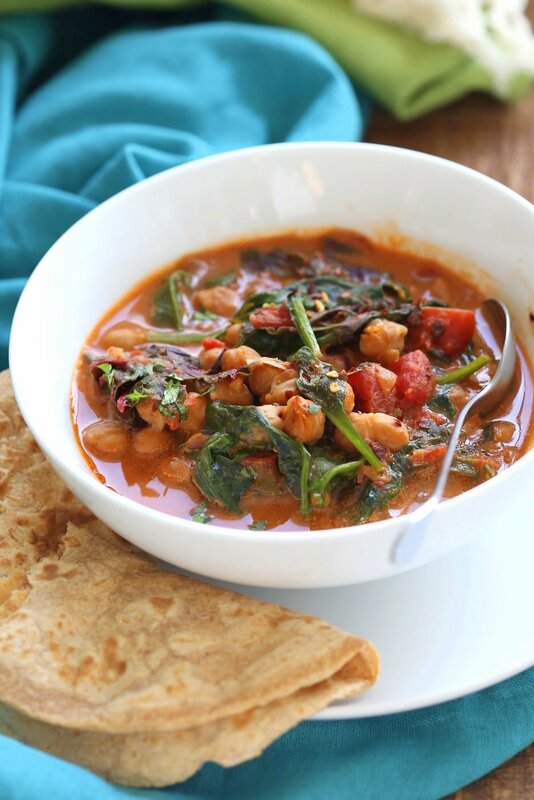 Indian Vegan Instant Pot Recipes: Indian cuisine has long embraced pressure cooking, and this group will inspire you to use all of those Indian spices. Richa Hingle, of Vegan Richa fame, is your host. 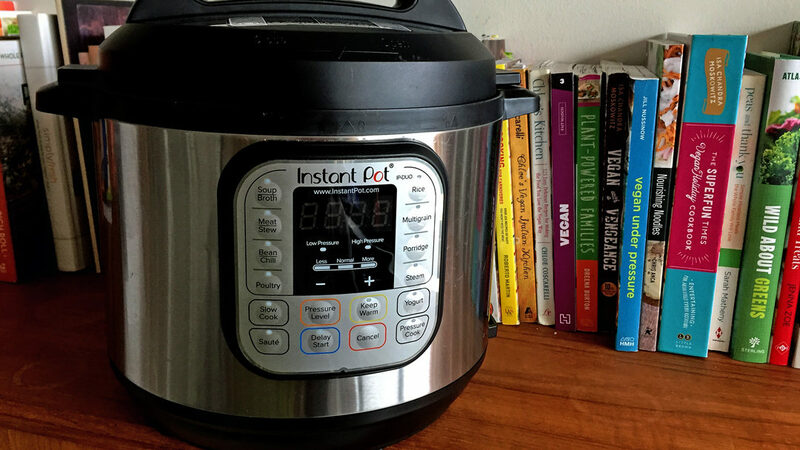 Do you use an Instant Pot? Has it been a good investment of kitchen space for you?